Its large, fiercely tribal population affects the Arabian Peninsula states’ perception of Yemeni internal stability; it may provide a potential inroad for Islamic extremism in the region. Yemen is officially distancing itself from terrorism. Improving relations with neighbors is its top priority. Yemen desires to join the Gulf Cooperation Council (GCC), but has been blocked due to its support of Iraq during the 1990-91 Gulf War. The recent treaty with Saudi Arabia and improving relationship with Kuwait may reenergize its bid for GCC membership. The government will focus on improving the economy, maintaining a credible military force, and improving intra- and extra-Peninsula relations. North Yemen. Yemen is one of the oldest centers of civilization in the world, with a history that dates to biblical times. By the 16th century, North Yemen was a nominally independent part of the Ottoman Empire. It had a political structure established by the Shi'a Zaydi sect. Zaydi Imams exercised sovereignty over North Yemen. At the end of World War I, Turkish forces left North Yemen, and Imam Yahya, leader of the Zaydi community, was able to consolidate his control over the region. After brief military encounters with Saudi Arabia and Britain, which had controlled the port of Aden since 1839, the region's boundaries were agreed by treaty. North Yemen joined the Arab League in 1945 and the United Nations in 1948. In 1948, Yahya was assassinated during a palace coup, and rebels opposed to his feudal rule briefly seized power. Yahya’s son, Ahmed, defeated the rebels and succeeded his father, remaining in power until his death in 1962. During Ahmed’s rule, North Yemen’s traditional isolationism faded. In 1958 it joined the United Arab Republic (Egypt and Syria) in forming a federation called the United Arab States, although this was doomed to dissolution in 1961. Pressure placed on North Yemen to play an increasing role in Egyptian President Gamal Abdul Nasser’s pan-Arabist movement led to heightened tensions with British colonial rulers who remained dominant in the South. South Yemen. Aden came under British rule in 1839. In 1937, it was made a crown colony, with East Aden and West Aden being designated protectorates. By 1965, many of the tribal states in the area had joined the British-sponsored Federation of South Arabia. However, by then strong nationalist sentiments had fostered the emergence of two rival groups: the Front for the Liberation of the Occupied South Yemen (FLOSY), which was supported by North Yemen, and the Marxist National Liberation Front (NLF). These groups turned to terrorism in their efforts to win independence from Britain. In 1967, British troops began withdrawing and federal rule soon collapsed. The NLF emerged as the stronger of the two nationalist groups and the British Government negotiated independence with the NLF in Geneva. South Arabia was declared independent on 30 November 1967 and renamed the People’s Republic of South Yemen. In November 1989, President Salih of the YAR and Ali Salim Al Baidh, Secretary-General of the YSP, signed an agreement to unify Yemen. A constitution was published before the end of the year, ratified by both countries, and approved by a referendum. In January 1990, the first meeting of the two Councils of Ministers was held in Sanaa. President Salih held meetings with Saudi Arabia’s King Fahd, who gave his cautious blessing to unification. Despite opposition in the North from those who feared an attack on traditional Islamic principles, and in the South from those who wanted to preserve secular freedoms such as the independence of women, formal unification was proclaimed on 22 May 1990. On 10 May 1994, the Southern forces declared the territory of the former PDRY to be the “Yemen Democratic Republic,” and in June the member states of the Gulf Cooperation Council (GCC), with the exception of Qatar, provided their de facto support for the secessionist movement. President Salih accused the Saudis of supporting the Southern Forces on numerous occasions. When the fighting ceased on 7 July, Al Baidh and his remaining ministers fled from Aden to Saudi Arabia. Yemen, one of the poorest countries in the Arab world, reported strong growth in the mid-1990s with the onset of oil production, but was harmed by low oil prices in 1998. It continues to be characterized by low levels of domestic industry and an inefficient agricultural sector that necessitates importing almost all essential goods. The southern city of Aden, with its refinery and port facilities, is the economic and commercial capital of Yemen. Future economic development depends heavily on Western-assisted development of the country’s moderate oil resources. Yemen has embarked on an IMF-supported structural adjustment program designed to modernize and streamline the economy, which has led to foreign debt relief and restructuring. Aided by higher oil prices in 1999, Yemen worked to maintain tight control over spending and implement additional components of the IMF program. The high population growth rate of 3.36 percent and internal political dissension complicate the government’s task. Sanaa is the political capital of a united Yemen, while Aden, with its refinery and port facilities, is the economic and commercial capital. The low level of domestic industry and agriculture has made northern Yemen dependent on imports for practically all of its essential needs. Land once used for export crops (cotton, fruit, and vegetables) is used to grow qat; qat leaves are chewed for their stimulant effect. Economic growth in southern Yemen has been constrained by a lack of incentives, centralized control over production decisions, investment allocation, and import choices. The border agreement with Saudi Arabia and the cooperation agreements signed with Qatar may help ease Yemen’s economic burden through increased employment opportunities for Yemenis outside the country. Major imports: Textiles, sugar, grain, machinery, chemicals, cement. Since unification in May 1990, there has been little economic information about the new national economy. At unification, the PDRY had a centrally controlled Marxist economy, while the YAR was market-oriented. The newly unified government has been trying to integrate these two disparate systems during the transitional period. Since unification, Yemen has relied heavily on foreign aid to sustain its weakened economy. This tact was substantially weakened by the political support Yemen provided to Iraq during the Gulf crisis. Saudi Arabia, Yemen’s largest contributor of foreign aid, cut off all aid payments and compelled an estimated 850,000 Yemeni workers to return to Yemen. The resultant economic dislocation caused an estimated US$2 billion loss to the national economy. Yemen’s natural resources are petroleum, fish, rock salt, marble, small deposits of coal, gold, lead, nickel, and copper. Oil has only recently been discovered; consequently, its potential has not yet been fully realized. Reserve figures are thought to be underestimated by a substantial amount, but until Yemen resolves external and internal political problems and encourages foreign investment, the true figures will not be known. Even before unification, the former YAR was exporting oil, increasing exports by some US$750 million. Once the reserves of the former PDRY – at least twice those of the YAR – are tapped, Yemen should start reaping substantial rewards. Gas has also been discovered – enough for export as well as domestic use. Again, reserve estimates are believed to be underestimated. Yemen is adjusting to the use of gas as an energy source by building gas-powered electricity generation stations and gas-bottling plants. As with most Middle Eastern states, the issue of fresh water is paramount in Yemen. The government is investing money in an attempt to ensure a regular fresh water supply. Presumably looking to the mountains and hills, the government may attempt to tap natural ground water from the mountains as one source. Most of this water would go towards agricultural needs. Yemen forms the southwestern corner of the Arabian Peninsula, with the Red Sea to the west and the Gulf of Aden to the south, having an area roughly twice the size of Wyoming. Generally, temperatures are hot, ranging from a low of 71oF (22°C) to a high of 99oF (37°C). On the coast and desert plains, conditions are generally hot and humid for most of the year, with very little rain. This is especially true of the southern coast. The Al Jahal mountains in northwest Yemen receive substantially more rain – often over 60 centimeters (23 inches) a year, falling mostly between March and September – and have lower temperatures, making the climate mild in winter and warm and moist during summer. Because of its location with respect to the equator (15° N), Yemen is a desert, warm and dry with mostly clear skies. The overall desert climate, however, can be separated into three major climate sub-regions based upon topography. Dominated by sand, gravel, and lava-covered open spaces, the first topographical climate sub-region is the narrow plain that lies along the coast. The width of the plain varies, but averages 20-25 nautical miles (NM). The second major climate sub-region is the Yemen highlands, covering the majority of the country away from the coast. The highlands consist of rugged mountains that dominate the west, along with a large inland region stretching eastward through high plateaus, mountains, and foothills. Finally, the far northeastern portion of the country is the third climate sub-region. Here an extraordinarily hot, harsh desert plain slopes into the desert interior of the Arabian Peninsula. Weather on the low coastal plain is relatively constant year-round: hot, humid, mostly clear skies, and very little rainfall. The immediate coastline to 2 NM inland stays cooler than the rest of the coastal plain because of the moderating influence of sea surface temperatures. Morning fog occasionally forms on the immediate coast. Away from the coast, the highlands are markedly cooler than the coastal plain. The highlands also have more variable cloud cover and precipitation throughout the year. This is because of the lifting of moisture from the sea, pushed up against the mountains by seasonal air patterns, or by daily sea breeze patterns. (A sea breeze is a daily occurrence where the difference in heating between land and water causes a persistent onshore wind at 6-10 knots, normally from mid-morning to early afternoon.) The upland desert plain in the northeast is almost uniformly hot, harsh, and desiccated. Seasonal variations in Yemen weather follow a monsoon climate pattern. A monsoon climate is defined by a definite shift in the direction of the prevailing wind from one season to the next. Seasons are named for the direction from which the monsoon wind blows, shifting by 120 degrees or more between seasons. The Yemen winter is the time of the northeast monsoon (known locally as “Gilal”) occurring December through March. The Yemen summer is the time of the southwest monsoon (“Hagai”), occurring June through September. Two short transition periods separate the monsoon seasons. The spring transition (“Gu”) occurs April through May, and the fall transition (“Der”) occurs October through November. A large-scale weather feature known as the near equatorial trough (NET), or monsoon trough, also affects Yemen weather. The NET stretches west to east across Africa and the Arabian Peninsula, and migrates north and south on a somewhat predictable timetable throughout the year, northward in the spring and southward in the fall. In Yemen, the NET usually migrates overhead only during the southwest monsoon (summer). For this reason, summer is the only time Yemen receives any measurable rainfall, and this is primarily in the highlands. All seasons in the narrow coastal plain have a preponderance of fair skies and little precipitation. However, there are more clouds in the coastal areas during the winter/northeast monsoon season than at any other time of year. Overnight, low cloud ceilings sometimes form below 3,000 feet (915 meters) from late evening to mid-morning. Very little rain falls. Though this is the coolest time of the year, daily winter highs in coastal areas are still warm, in the mid-80's Fahrenheit, with daily lows ranging from the upper 60's to the low 70's Fahrenheit. Higher elevation winter weather is relatively mild. Over the foothills where inland mountains face the coast, clouds are likely to form between 0900 and 1800 local standard time (LST). Sea breezes also produce occasional rain showers and thunderstorms along the mountains. In the inland highlands, clear skies are common with undisturbed weather. Isolated showers and thunderstorms can occur when Mediterranean cold fronts reach the area. By December a cold front crosses the area every 5-10 days, bringing light precipitation and increased mid- and upper-level clouds. Significant precipitation is relatively rare in winter, but the highest elevations receive the most. Precipitation in the form of snow falls above 10,000 feet (3,050 meters), but accumulations of 6 inches are rare. Depending on elevation, daily winter high temperatures in the highlands are generally in the 60's and 70's Fahrenheit, with daily lows ranging from the 40's to the 60's Fahrenheit. Sanaa has dropped to 22° Fahrenheit in December. During the spring transition, coastal areas remain hot, humid, and dry. Mid-afternoon fair weather cumulus clouds are not uncommon. Very little rain falls. Springtime high temperatures along the coast are in the upper 80’s to low 90’s Fahrenheit, with lows generally in the upper 70’s to lower 80’s Fahrenheit. Higher elevation weather during spring transition shows an increasing likelihood for clouds and showers on the western slopes and a decreasing frequency of clouds and showers on the eastern slopes from April to May. Spring highland high temperatures are generally in the 70’s and 80’s Fahrenheit, with lows ranging from the 40’s to the 70’s Fahrenheit, depending on elevation. During the summer/southwest monsoon, coastal areas are very hot, humid, and dry. Strong daytime sea breezes produce fair weather cumulus clouds on the immediate coastline. Two areas of the coast require more detailed discussion. There is an increased likelihood of thunderstorms with light rain after midnight north of the city of Aden toward the mountains. On the immediate coast east of Riyan toward Ras Fartak, spotty early morning drizzle is possible because of strong upwelling of cool ocean water in this section. Summer high temperatures along the coast are in the 90's Fahrenheit, with lows generally near 80° Fahrenheit. In the highlands, a well-defined diurnal cloud and precipitation pattern forms west to east across the Yemen and Asir Mountains. The arrival and orientation of the NET in summer causes hot, dry, and cloud-free skies to dominate eastern slopes, while substantial rainfall and cooler daytime temperatures dominate western slopes. This feature of the western slopes is caused by the influence of sea breeze circulation. On the western slopes, afternoon sea breezes cause frequent and significant cloudiness, rain showers, and embedded thunderstorms. Rainfall often occurs between 1400 and 1800 LST. Clouds generally dissipate after midnight and skies are generally clear in the early morning. Summer highland high temperatures vary widely with elevation and location. June is generally the warmest summer month, with daily highs diminishing through September. During the fall transition, coastal areas remain hot, humid, and dry. Cloud cover is minimal, with mid-afternoon sea breeze cumulus typically the extent of cloudiness. Fall high temperatures along the coast are in the upper 80’s Fahrenheit, with lows generally in the mid 70’s Fahrenheit. As the NET recedes southward, the fall transition season in the highlands is the driest period of the year. Most places average less than an inch of precipitation for the entire two month fall season. Cloudiness is also minimal. Fall highland high temperatures are generally in the 70’s Fahrenheit, with lows ranging from the 40’s to the 60’s Fahrenheit, depending on elevation. Visibility along the coastal plain in Yemen is mainly affected when strong daytime sea breezes raise sand and dust. Year-round, however, visibilities are above 3 miles more than 95 percent of the time. During the dryness of the southwest/summer monsoon, a thin haze is common, with visibilities of 4-7 miles. Also during the summer, early morning fog and stratus are obstructions to vision east of Riyan. Extensive thin fog may persist along the water and immediate coastline until 1600-1700 LST. In the highlands, visibility is generally excellent. Isolated locations may see morning ground fog, and strong winds can cause reduced visibility because of dust. During summer, local heat-induced dust storms are possible. Effects of frontal weather (e.g., a cold front) are minimal in Yemen. Wintertime cold fronts push southward into the highlands of Yemen, but are generally weak and short lived. Tropical cyclones (known as hurricanes or tropical storms in the northern Atlantic Ocean) pose little danger to Yemen. Flying weather is generally good in Yemen. Ceilings less than 1,500 feet (450 meters) are restricted to summer, and occur less than 20 percent of the time in the highlands and on the coast. Visibility less than 3 miles (8,000 meters) is infrequent, and occurs mainly in the summer because of blowing dust. The weather in Yemen is generally good for reconnaissance because of generally clear skies. Conditions may briefly worsen in blowing dust/sand and during rainshower/thunderstorm activity. Yemen contains 527,970 square kilometers (205,908 square miles) and is slightly larger than twice the size of Wyoming. To the north, Yemen is bordered by Saudi Arabia (a border of 1,458 kilometers [904 miles]), to the east by Oman (288 kilometers [179 miles]), to the west by the Red Sea, and to the south by the Gulf of Aden. Yemen claims 12 nautical miles for territorial waters, a contiguous zone of 18 nautical miles, and a 200-nautical mile exclusive economic zone. Yemen disputes the undefined section of boundary with Saudi Arabia. The treaty with Oman to settle the Yemeni-Omani boundary was ratified in December 1992. The terrain is diverse, with flat, dry, coastal plains and soaring mountains in the interior. The Tihama, a hot, sandy, semi-desert strip about 64 kilometers (40 miles) wide, separates the Red Sea coast from the generally less arid mountainous area of the interior. The mountains, heavily terraced for agriculture, reach heights of 3,658 meters (12,000 feet) above sea level. A normally sufficient rainfall and agreeable mountain climate make the area one of the most important agricultural areas of the Arabian Peninsula. Yemen has over 4,000 kilometers (2,480 miles) of surfaced road; a good road network exists in the former Yemen Arab Republic (YAR) that links most towns and villages. Other roads have a natural surface, but are of reasonable quality. There are roads that link with those of the former People's Democratic Republic of Yemen (PDRY), but these decline in quality. The former PDRY's road network is extensive only in the southeast. Yemen does not have a railway network. Yemen's primary port is Aden. It played a significant role for ships passing through the Suez Canal until its closure in 1967; since its re-opening in 1975, it has not regained its former glory. However, it is currently undergoing an extensive development project in an effort to increase its capability. Aden has a 244-meter (800-foot) cargo wharf that can take ships 91 meters (300 feet) long with a 5.5 meter (18 foot) draft, as well as 24 first-class berths and an oil harbor that can handle four 57,900-ton tankers of up to 12-meter (40-foot) draft. Floating cranes, mobile cranes, and numerous forklifts are available. The port can handle tankers as well as roll-on/roll-off (RO/RO) and container cargos. The port has facilities for ship repairs. Khormaksar Airport is located 8 kilometers (5 miles) from the seaport. Al Hodeidah is located 215 kilometers (133 miles) north of the Bab al Mendeb along the Red Sea coast. It has an anchorage point of 10 meters (33 feet) deep. The approach to the anchorage is through a 16.5-kilometer (10-mile) long channel that is 10 meters (33 feet) deep. The port can handle container, tanker, bulk cargo, and RO/RO vessels. Hodeidha airport is 7 kilometers (4 miles) from the seaport. Other Yemeni ports include Al Mukalla, Al Mocha, Nashtoun, and Al Salif. Both Nashtoun and Al Salif are newly constructed, and the Yemeni government has high hopes that they will play important roles in the fishing and mineral salt industries, respectively. Two other ports, Ras Issa and Bir Ali, are becoming increasingly important to Yemen's economy, since they are primarily involved in the export of crude oil. Al Hodeidah, Al Mocha, Al Salif, and Ras Issa are located on the Red Sea, while the others are located on the Arabian Sea. There are five radio broadcast stations: four AM and one FM. All radio broadcasts are in Arabic. Personal shortwave receiver is the only way to ensure Voice of America reception. There are 10 TV broadcast stations. All programs are broadcast in Arabic, with the exception of a 7:30 p.m. news show, which is broadcast in English. The central telephone office is located in Sanaa opposite the Chinese Embassy. International calls can be made for 150 riyals to nearly all countries. There are more newspapers published in Yemen than in any other Arab state. The English language Yemen Times, The Middle East Times, and Arab News are available and widely praised as an example of the freedom of the press. Time and Newsweek are also widely available. The official population of Yemen is estimated at 17 million people. The bulk of it is concentrated in the north. Most of Yemen's inhabitants live in rural areas; only 24 percent of the people live in urban centers. In contrast with the nomadic traditions of other Arabian Peninsula inhabitants, Yemenis have long been settled in small agricultural communities. Yemenis are characterized as Semitic, with African ties common, especially in the Tihama coastal strip. Many Yemenis have close family ties in Ethiopia, Somalia, and Djibouti. Yemenis are proud of their ancient culture and history, and regard their distinctive civilization as a unifying force among the many tribes that make up the population. In spite of this, numerous issues divide the population and prevent Yemen from emerging from underdevelopment. Regional differences have caused the greatest rift among Yemen's population. Deep feelings of mistrust and resentment still exist between northern and southern Yemenis following the 1994 civil war. Additionally, the Hawdramaut region in eastern Yemen has long been isolated from the major power centers of Aden and Sanaa and, consequently, has developed its own conservative and deeply religious culture. The Tihama region, along Yemen's northwestern coast, is culturally different from the rest of northern Yemen. The Tiahma has more ethnic and cultural ties to Africa than to South Arabia, resulting in a dramatic contrast between the inhabitants of the Tihama and inland Yemen. Tribal differences also add to the schism within the population. Northern Yemen is dominated by tribes and tribalism, which many urban Yemenis (particularly in the south) regard as backwards and primitive. The tribes have often been in conflict with one another, but more recently have begun to band together for mutual support against the central government. The tribes see the government as threatening tribal autonomy as well as traditional life and values. Tribes have been a basic element of the social structure of Yemen for thousands of years, and remain important even today. Tribal affiliation is especially important for those in the north, which comprises nearly two-thirds of the population. However, great regional differences exist even within the tribal community. The different origins of the southern and the northern groups were of great political importance in the first centuries of the Islamic age, and have not been forgotten to the present day. In many parts of Yemen, it is not uncommon to see men from the tribes heavily armed. The tribes rather than the central government likely own armored cars seen in certain areas. All these weapons are used in feuds, skirmishes, and tribal conflicts outside the control of the government in Sanaa. At its simplest level, the tribe is a political unit based on a particular region. It has fixed borders, a known number of members at any one time, and a certain amount of political autonomy with which it interacts with other tribes and with the central government. Almost all the tribes in Yemen now lead settled lives. Most subsist on agriculture, planting their fields either with grain, such as sorghum, millet, wheat or maize, for their own use or with cash crops, such as coffee, bananas, or grapes, for the market. Some members earn their living as craftsmen. One reason why tribal structures have survived so long in Yemen is their flexibility. Over the last 1,400 years, since the rise of Islam, nations have arisen and disappeared again. Yemeni tribes were incorporated in these nations, but remained responsible for the administration of their tribal areas. In those periods when central authority crumbled and fell apart, tribes ensured the survival of social order by their traditions and laws. Religious differences also divide the population. Northern Yemen is predominantly Zaydi Muslim, a smaller sect of Shia Islam also called “Fivers” for their acceptance of only the first five Imams after Hussein’s death. 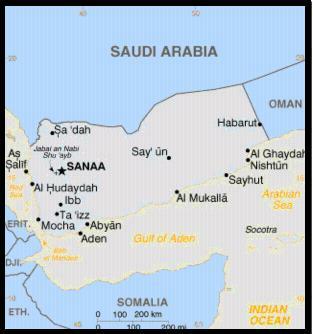 Southern Yemen is predominantly Shafa’i Sunni Muslim. While religious differences are not openly acknowledged as divisive, the conservative nature of the Zaydis in the north has caused resentment among many southern Yemenis, who feel the Zaydis have no right to force their brand of morality on the south. In the north, the inhabitants of the Tihama region are mainly Sunni or non-Zaydi Shia, and many women in the region go about unveiled. A low level of education continues to plague development of the state; however, the number of students has greatly expanded in recent years. Primary education begins at age 6 and lasts for 6 years. Secondary education, beginning at age 12, lasts for another 6 years. As a proportion of the school-age population, the total enrollment at primary and secondary schools was 56 percent (85 percent males, 25 percent females). There is a university in Sanaa and over 20 technical and vocational institutes spread throughout the country. While the current internal security situation may prohibit U.S. military personnel from engaging in tourist activities, Yemen does have a rich heritage and offers vast opportunities for travel and exploration. In the silver markets of Sanaa, antique and old-looking metalwares are sold. The souq is open daily but is best visited in the morning, when activity peaks, or between 1800 and 1900. The most imposing sight in Sanaa is the old city, especially the eastern part. Many of the houses are more than 400 years old and all are built in the same unique style of 1,000 years ago. The walled city is one of the largest completely preserved ancient cities in the Arab world. On the southeastern tip of the walled city, the old citadel stands on a hill. It is used by the military and may not be entered. It is important to sit properly. Slouching, draping legs over the arm of a chair, or otherwise sitting carelessly when talking with someone communicates a lack of respect for that person. Legs are never crossed on top of a desk or table when talking with someone. When standing in conversation with someone, leaning against a wall or keeping the hands in pockets is taken as a lack of respect. Sitting in a manner that allows the soles of one’s shoe to face another person is a very serious insult. One should always sit with both feet on the floor. Failure to shake hands when meeting someone or saying good-bye is considered rude. When a Western man is introduced to an Arab woman, it is the woman’s choice whether to shake hands or not; she should be allowed to make the first move. One who lights up a cigarette in a group must be prepared to offer cigarettes to everyone. Men stand when a woman enters the room; everyone stands when new guests arrive at a social gathering and when an elderly or high-ranking person arrives or departs. Men allow women to precede them through doorways, and men offer their seats to women if none are available. If guests admire something small and portable, an Arab may insist that it be taken as a gift. Guests need to be careful about expressing admiration for small, expensive possessions. Gifts are given and accepted with both hands and are not opened in the presence of the donor. At a restaurant, Arabs will almost always insist on paying, especially if there are not many people in the party or if it is a business-related occasion. Giving in graciously after a ritual gesture to pay and then returning the favor later is an appropriate response. People, especially women, should not be photographed without their permission. Most Arabs do not like to touch or be in the presence of household animals, especially dogs. Pets should be kept out of sight when Arab guests are present. The Koran calls for both women and men to dress modestly. Foreigners traveling in Muslin (especially Arab Muslim) countries must be aware of the cultural and religious dress standards expected of both locals and visiting foreigners. While Yemen is not as restrictive as Saudi Arabia with regard to acceptable dress standards, it is best to err on the side of caution. For men, long-sleeve, collared shirts with slacks are the norm. For women, long dresses that cover the entire leg are advisable. Long-sleeve, high-neck blouses are also recommended. A woman may carry a scarf or shawl to quickly cover her head and shoulders, should she find herself in the presence of more conservative local Arabs. Casual dress at social events, many of which call for formal dress (suit and tie for men, dress and high heels for women), may be taken as a lack of respect for the host. Yemeni restaurants are not places of social interaction. Lunch is the main meal of the day. In lieu of utensils, fingers of the right hand and a piece of bread are used. Bottled water and soft drinks are widely available. Never drink water from the standard plastic jugs in restaurants. Alcohol is banned, but there is a large trade in smuggled liquor. U.S. personnel are advised to avoid consumption of alcohol due to potential legal complications.